MONTREAL – Montreal Canadiens general manager Marc Bergevin, announced today the signing of forward Jeremy Grégoire to a three-year, entry level contract (2014-15 to 2016-17). In 65 regular season games with the Baie-Comeau Drakkar (QMJHL) in 2013-14, the 6’0’’ and 187 lbs forward collected 69 points (35 goals, 34 assists). Grégoire led his team in goals and powerplay goals (14). He ranked second in points and shots on goal (265), while finishing fourth in assists. Grégoire maintained a +25 differential. He helped Baie-Comeau reach the QMJHL finals, leading the Drakkar with 23 points (9 goals, 14 assists) in 22 playoff games. Grégoire, 18, has registered 131 points (69 goals, 62 assists) and served 243 penalty minutes in 188 regular season contests since making his junior debut in 2011-12 with the Chicoutimi Saguenéens. He has added 45 points (20 goals, 25 assists) in 58 playoff games. 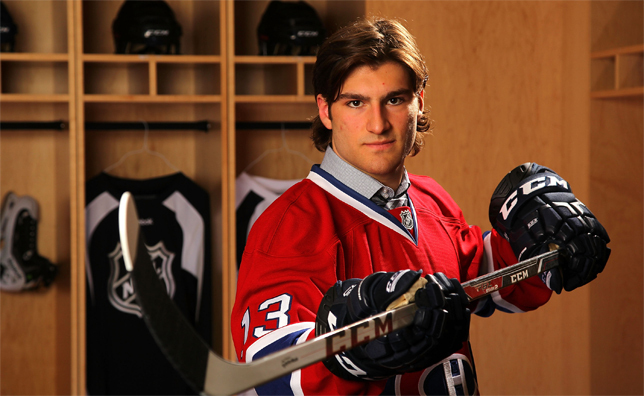 A native of Sherbrooke, Quebec, Grégoire was selected in the sixth round, 176th overall by the Canadiens at the 2013 NHL Entry Draft. He was awarded the Guy Lafleur Award of Excellence for the 2013-14 season as the candidate of the QMJHL.